Hey everyone this is my 50th post!! !...and I wanted to start something new. 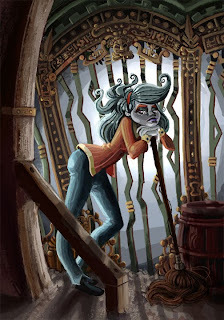 Every Tuesday I am going to post one image from a story I have been developing called The Time Tailor. Instead of telling you the story I want to let the paintings do the talking that way every week you get a new piece of the puzzle. It should be kind of a challenge, but I think it will be really fun. So the first image is the main character CLoWy. For those of you who went to scad with me you might remember that name from a character I was designing for one of my old friends Dixie. She didn't care for it too much, but I always thought it had some charm so now I am using it! Thanks for watching and keep checking in for more updates! Hey Zane! Congrats on your 50th post. This is a great character. Love the pose and expression. Great storytelling. Oh and the colors are great. Wish I could color like that. Look forward to your tues. posts from here on in. Great stuff Zane. I really dig the detail work in the background! Very impressive!